Opened in the 1980s, green spaces such as Tampines Central Park were one of the town planning innovations introduced by the Housing & Development Board (HDB). 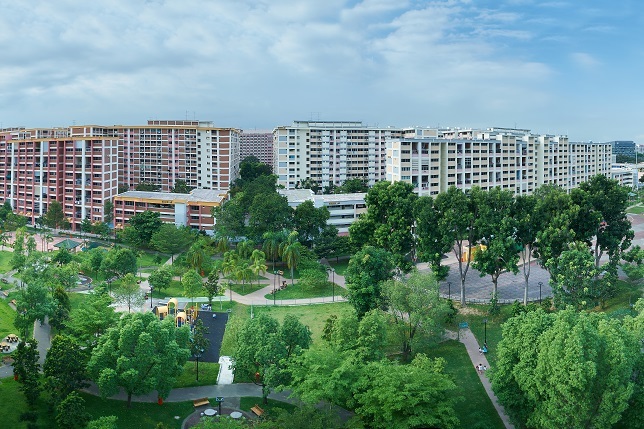 The design of Tampines Town integrated green spaces throughout the residential estates and mitigated the pressures of high-density living while offering a variety of recreational and social uses. Among the distinguishing features of this park are the fruit-themed playgrounds in the shapes of mangosteens and watermelon slices. Designed by HDB architect Ms Lee-Loy Kwee Wah, they were inspired by the fruit farms of rural Tampines before the town was developed. These playgrounds are part of the second generation of HDB-designed playgrounds that appeared in the 1980s. Another feature of the Tampines Central Park is a sculpture by renowned Singapore artist and Cultural Medallion recipient, Ng Eng Teng (1934-2001). This bronze sculpture is one of the iconic Mother and Child works created by Ng, whose artworks were known to explore the human condition. Today, Tampines Central Park remains a green social space where community, food and music events are hosted, including a notable concert by the Singapore Symphony Orchestra in 2002.